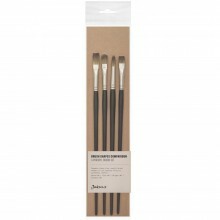 Jackson's Procryl Brushes are designed for professional oil and acrylic painters. Made with acrylic fibres and a long matte black handle, they are moderately springy and absorbent. These brushes soften slightly after repeated cleaning with solvents.